A manga artist travels back in time without a Delorean or a police box, exploring the concept of second chances. 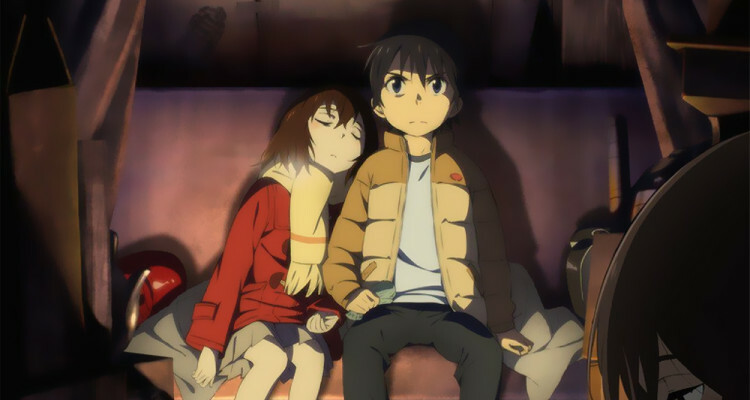 I usually don’t consider time travel stories among my favorites, though there are some exceptions besides the anime series Erased (based on the manga by Kei Sanbe). All of that to say, while I didn’t start watching Erased because it had a time travel element in it, that element didn’t drive me off, and in the context of this story it worked very well. Satoru Fujinuma is a man in his late 20s struggling to break into the world of manga artists. Occasionally, he’ll experience what he calls “revivals”, where his life will rewind itself for a few seconds or a few minutes. He’s aware when this happens, and uses this time to try to prevent something bad from happening, such as in the first episode when he prevents a runaway truck from hitting a boy crossing the street. When he comes home one night to find that his mother has been murdered, he experiences a very drastic “revival,” one that sends him back to a few days before his 11th birthday. This was the winter one of his classmates, a girl named Kayo Hinazuki, went missing, and her body wasn’t found until after the snows melted. His return to the past is also just before she goes missing. Because he thinks there may be a connection between his mother’s murder and the death of his classmate and other children in the area at that same time, he tries to prevent Kayo from getting killed. But it also allows him to see things that his younger self had missed. When he notices a bruise on Kayo’s leg, and then reads a composition she wrote about wanting to be alone on an island, he realizes that even before she was killed, bad things were happening to her. So his attempts to save her life also end up being attempts to get her out of an abusive home. I’ll try to avoid too much that might be spoiler material, but what comes next might fit that category for some people, so be warned. Satoru’s first attempt to change the past failed, and he got booted back to the present into the middle of the same predicament he had left. He does discovers that he had been able to make a few small changes, but nothing significant. Then, when he gets another chance, he is able to keep some things from happening, but makes other mistakes that are costly to him. I’d guess I’m not the only person who’s ever wanted to jump back in time a few minutes or a few hours and redo something. I’ve thought it would be helpful, though, really, I’d likely just be trading one set of mistakes for another. I’d probably spend most of my re-dos exploring new and creative ways to really and monumentally mess things up. One thing that’s evident early in that story is that the relationship between Satoru and his mother is strained. The reasons seem to range from his own lack of success to some things that happened during the kidnapping spree when he was a child. One of the things I liked during the series was seeing his view of his mother change. Returning to the past after seeing her dead reminds him of many of the good things they’d had that he’d forgotten about. It’s good to see them on good terms. And I’ll not spoil the last part of the story, except that it shows her love for her son in a particularly strong way. On the other hand, there is another mother-child relationship that is very much worse. Some of the series’ most disturbing scenes involve what Kayo’s mother does to her, and how she tries to cover it up. The contrast between the two mothers is most clearly shown when Satoru’s mother allows Kayo into their home while Satoru is trying to hide her, particularly the breakfast scene. I’ll just mention it here, but let you watch it for yourself, if you wish. That’s not the last time I’ve heard such an idea. It seems to be fairly popular. But is it true? Because the truth is, the revivals of “Erased” are fictions. We don’t get replays or rewinds, we don’t get to go back to the last saved moment, the past will always be the past and never again be the present. The things we did wrong yesterday will always be done and be wrong. Although I can understand the point trying to be made, I’m not sure it’s a point that’s true. The truth is, there are no second chances. God doesn’t give us chances to redo what we did wrong yesterday, or even five minutes ago. God doesn’t give us rewinds, but he has redeemed those who are His. “Erased” is a very engaging series. The time travel element is done intelligently, and the story is told in a way that does well in increasing the tension and the stakes. There are some disturbing scenes where ugliness is shown, but also ones where kindness is well displayed, too. I can give it a strong recommendation. Sounds awesome, I may have to check this out :). I’d recommend Steins Gate since you liked this anime. Steins Gate is another time travel anime where the main char is trying to save someone. Thanks. I’ve heard of Steins Gate, but haven’t yet watched any of it. I’m working through “World Trigger” right now, but I’ll try to keep it in mind. My wife and began this story tonight on Crunchyroll. Two episodes in. Thanks for this review, Audie! You’re welcomed, hope ya’ll enjoy it.